Back in November, I wasn’t sure if anyone would mind that I used Wikileaks for historical research. Some might have called it unpatriotic. But I should have expected that no one seemed to mind (or care?). I did it because I was about to give a lecture on the promotion of nuclear technology, and found that typing in “IAEA” into the keyword-searchable databases of Wikileaks yielded some interesting results. It was like being a fly on the wall for discussions among people who were dealing with the decades-long legacy of America’s attempt to promote nuclear technology in the developing world. It was perfect material with which to open a lecture. And since that also will be the subject of my next book project (after Arming Mother Nature comes out, of course), how could I resist using it? My concerns proved unwarranted, at least thus far. I mention my trepidation because, before boarding my flight back in November, I received an email warning me to think carefully about whether I wanted to bring radioactive materials to Florida from Oregon. (note to careful readers: I did not do any such thing). The person had heard about my upcoming lecture and had begun to panic about my starting cancer in the local population. (again: I did nothing of the kind). I was getting on a plane all right, but with far less interesting carry-ons, unless you count my iPad. 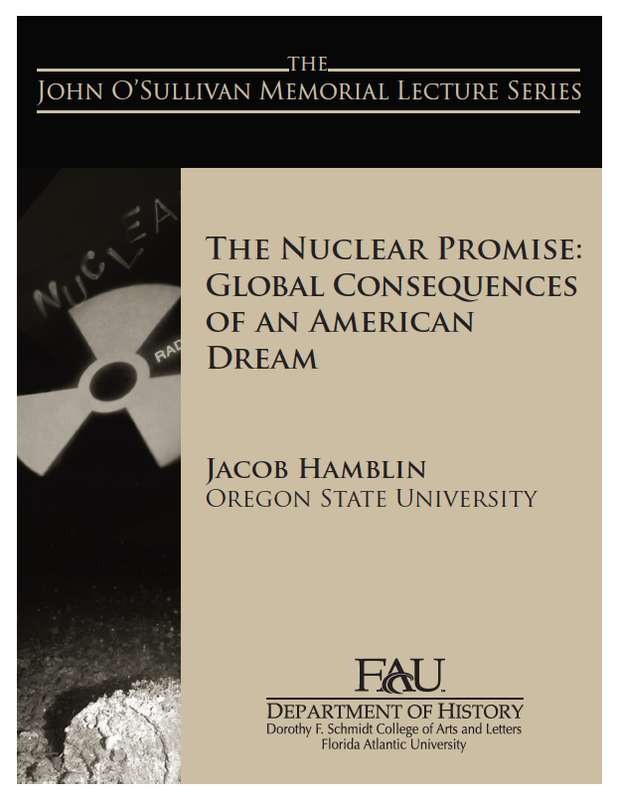 The truth was that I was invited in November to give the annual John O’Sullivan Memorial Lecture, in Boca Raton Florida, hosted by the Department of History at Florida Atlantic University. I enjoyed every moment I was there. I met so many wonderful folks that it was hard to leave, and I learned a great deal about the research interests of the faculty member for whom the lecture is named. It was a privilege to meet John O’Sullivan’s wife and grown son. John O’Sullivan clearly left his mark on the community, and I was honored to be a part of it by giving the memorial lecture. I mention all this because Florida Atlantic University has published my lecture as a PDF pamphlet. It contains information about the lecture series, about O’Sullivan, and of course my lecture. Enjoy!